For most men, shaving is just a daily task to be completed every morning. Not every guy likes splattering their face with shaving cream and running a sharp razor across their neck just after waking up. There’s nothing wrong with this. Guys like this will benefit from standard electric shavers or single-use blades. These get the job done quickly so men can get on with their day. However, those that indulge in their hair-care process use a more stylish and classic method – the straight user. 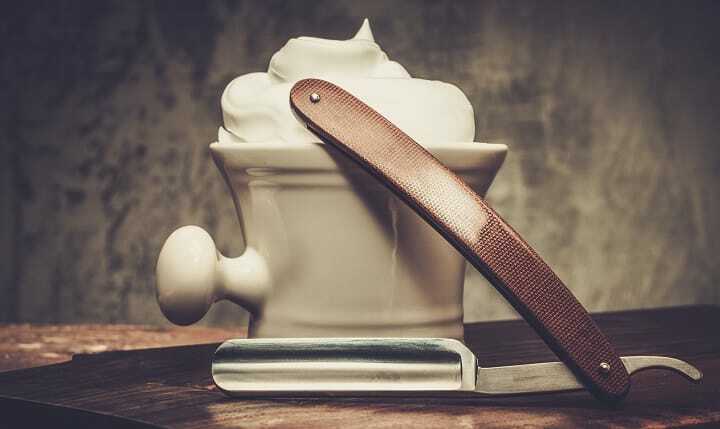 Anyone that enjoys their morning shaving routine but doesn’t already have a straight razor might want to consider bringing one into their home. But what exactly is a straight razor? You’ve seen them in history textbooks and in movies or TV shows. 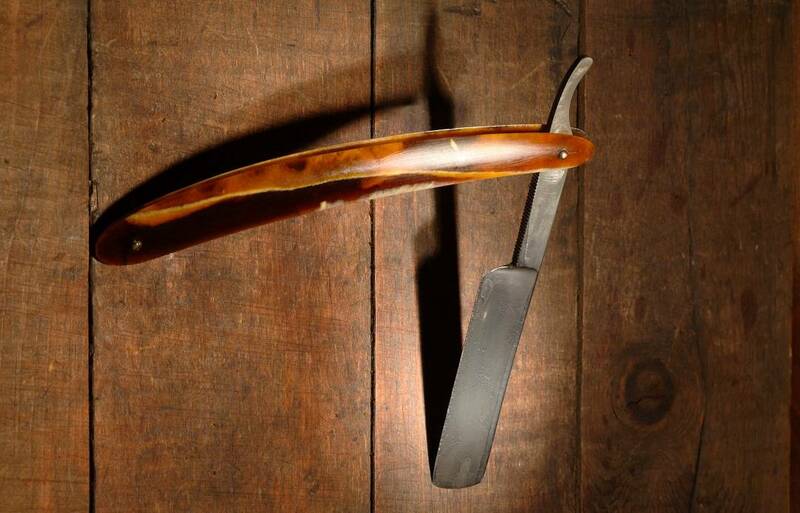 A folding straight razor is one of the earliest methods of shaving, first used in England in the 17th century. This device is essentially a sharp blade attached to a folding handle. It resembles a knife more than a contemporary shaver, and because of this earned the name the “cutthroat” razors. 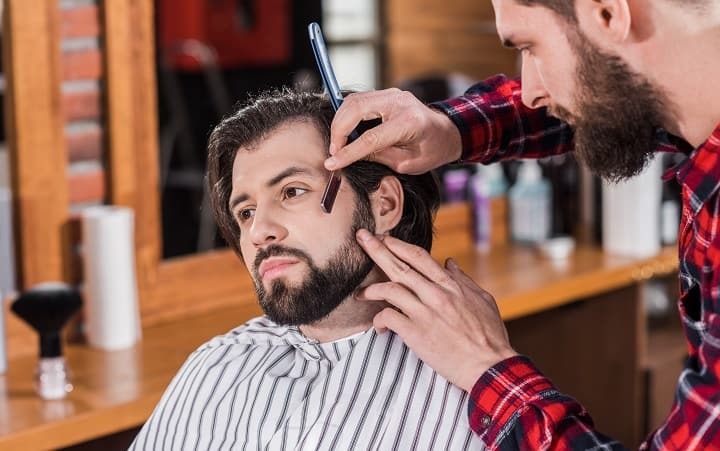 Barbers throughout history used them to get the closest shave possible, but the more convenient safety and electric models replaced this method. However, straight razors haven’t gone out of style. Those that believe shaving is an art agree that the straight razor is not only the most effective way to shave but also the most stylish. An entire culture has developed around straight razors, and many men even have their own initials engraved in their personal device. Straight razors have made a huge comeback, and therefore the market is flooded with style-conscious options to satisfy any shaving enthusiasts. It’s important not to invest in an overly expensive design or novelty knock-off. Instead of purchasing the first model that catches your attention, learn what exactly qualifies as a great straight razor with this comprehensive buyers guide. Judging whether a straight razor is high-quality is arguably more complicated than learning how to actually use one. There are certain models to avoid, but personal preference, as well as skin and hair type, plays the biggest role in determining what razor is right for each man. A straight razor is a tool like a saw, drill, or car. Like any machine, its effectiveness is as good as its parts. If a razor was improperly made or made with cheap materials, its effectiveness will be tarnished and buyers will be regretful. When searching for an ideal straight razor for you, you’re likely to encounter models with cheap blades. These products are more like toys than cutthroat tools and can be avoided if you know what to look for in a quality straight razor. There are a few factors you can always consider when browsing for straight razors. These will always affect not only the sharpness of the razor but how it will feel on your skin. Straight razors are made with either stainless or carbon steel. Stainless steel is common among beginners because it’s less expensive and the sharpness lasts longer. However, most enthusiasts use carbon steel. This is because carbon blades are made with overall higher quality. 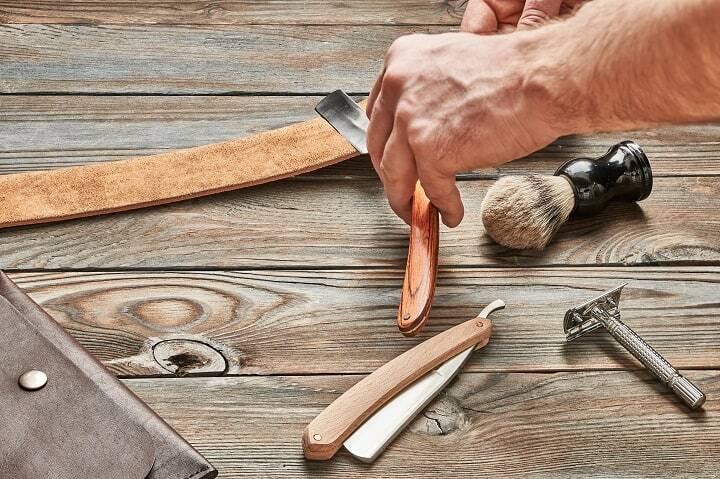 If you’re a first timer and still need to learn how to shave with a straight razor, a stainless steel model will be best because it’s a more affordable way to learn. Once you’ve mastered your stroke, you’ll be ready to move up to carbon. 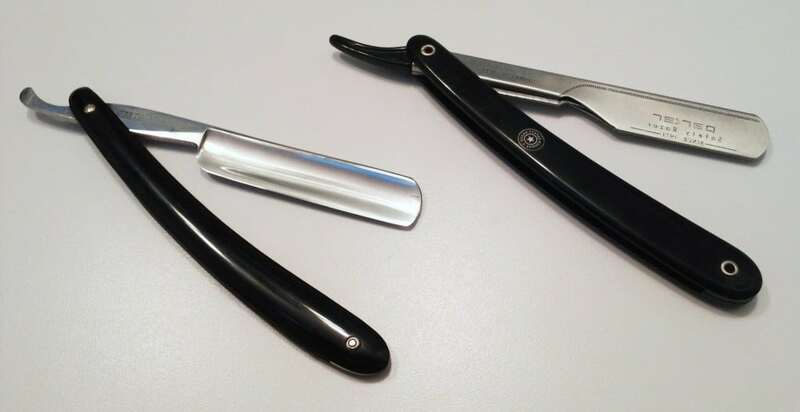 If you’re attracted to antiques and have the pocket change to restore a vintage straight razor with contemporary swiftness, definitely consider investing in a vintage razor. There is nothing quite like owning a piece of history, and with a few upgrades, your antique can be a long-lasting blade. These blades can be bought internationally and restored for reasonable prices. This is only recommended for expert users. Those who need experience should stick to modern style. They are built with new parts and better craftsmanship than antique razors. Razor designers know they’re building models for a niche market of enthusiasts that value the quality of the product, so they make sure to build with care. A modern blade will always be immediately in better condition than a vintage one. You won’t have to deal with rust or aging parts, which makes shaving extremely dangerous. There are many modern razors on the market that are convenient and easy to use with contemporary style. The most important advantage of modern blades is that you get to shop for specific blade and razor qualities intended to suit your skin best. 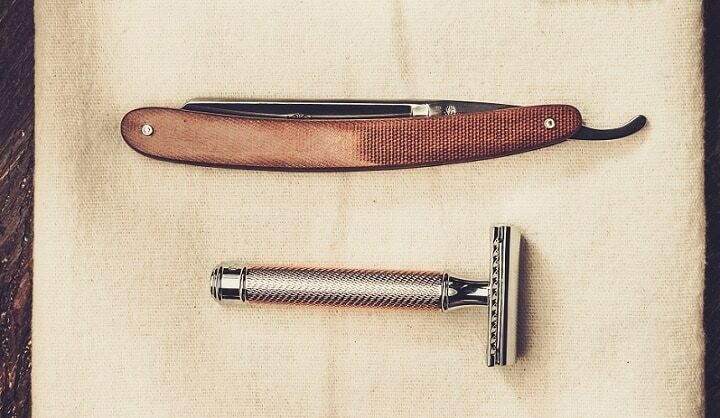 With an antique razor, you never know if the blade profile will be too harsh for your skin. Despite these factors, a razor’s quality ultimately comes down to its blade. There are several important things to know about a razor blade that will impact your shave. Blades are designed for all types of skin types and facial hair, so it’s important you know what to look for. Otherwise, you won’t find your match. Unlike electric shavers, safety shavers, or any other type on the market, straight razors are made with different blade qualities. When you purchase a straight razor, you’re getting a singular type that’s unique among others. The point type of a razor alters how the blade will run against your skin. There are three types to consider. This blade profile is semicircular rather than flat and harsh. It’s for beginners who need to adjust to their new shaving method. It’s also for those weary of self-injury. Round blades are most forgivable against the skin. A razor with a round point is the best shaving razor for sensitive skin. Also known as a sharp blade, this blade profile is defined by sharp corners at the end of the razor. This is for advanced users who have experience shaving with a straight razor. The sharp corner requires the delicate use and is effective for hard to reach spots and the closest shave possible. This blade profile takes qualities of the other two types. With a semi-circular blade and sharp corners, this razor is really for intermediate users who can handle sharp points but still need to smooth out their stroke. Point types are intended for various types of users. None of these types impact the quality of the blade, just how it will cut against the skin. Width specifically refers to the distance between the cutting edge and back of the blade. Blade widths fluctuate between 1/8 increments. Blade width impacts whether a razor is precise or cumbersome to use. While the width of the blade doesn’t impact the closeness of a shave if a user strops the blade to its intended sharpness. Stropping is the process of making the blade sharper with a leather material. Stropping keeps a razor as sharp as it’s supposed to be. A smaller blade is easier to strop and fine tune. Smaller blades also give the shaver better sight when shaving. Without a large razor in the way, users can see clearly where the razor is touching their skin. A large blade will provide a harsher shave. For experts this is ideal, but for beginners, it will be difficult to see exactly where the blade is on the skin. This will make it difficult to reach spots like under the nose. All blades are measured by temper, which dictates how long a blade will stay sharp. Blades with a hard temper will retain their edge for longer than a blade with a medium temper or soft temper. Soft temper blades are easier to sharpen, even though they will become duller quicker than the hard temper blades. Some enthusiasts believe that hard temper razors are better than soft because they retain sharpness. Others like to polish their razors consistently. Temper is less of a standard for quality and should be based on personal preference. Would you rather have a sharp blade that will keep its longevity, or have constant control over how sharp your blade is? At the end of the day, a sharp straight razor is an effective one. How long the sharpness lasts isn’t as important as whether it was made with a high-quality blade. Not only do point profiles create various types of razors, but the grind of each razor effects shaving quality. Each blade is built with concave indentions called the grind. The grind adjusts how sharp the blade is. A hollow grind creates a thinner blade. This is a more flexible and swifter blade type that’s better for fast movement and precise shaving. This is because the hollow grind has flexibility and can move easily along the curves of a face. Hollow grind suits those with average length beards and light facial hair the best. Barbers use this grind type most often. This is a much thicker blade type that is difficult to master, but effective for those with thicker hair. It does not give a close of a shave as the hollow grind, but it will ultimately cut through tough hair better than the hollow grind. The simplest answer to what makes the best straight razor is to choose a model with qualities designed for your skin. Safety and quality are most important. Style should always come second. Remember that you can have a more style-conscious razor as you become more experienced. It’s more important to select a model that you’re comfortable with, rather than a tool you can show off. Judging a razor and its blade by all of these standards will give you the most informed perspective on what razor type fits you best. 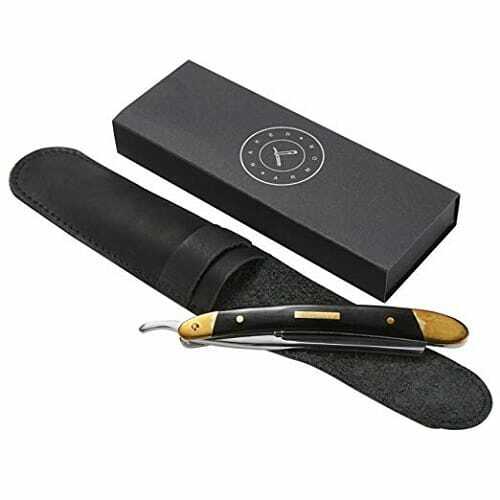 Both functional and stylish looking, Akunsz Straight Razor Kit also includes double-layer leather strop and velvet bag. Wooden, rosewood handle is durable and ergonomically designed, so it provides a very comfortable grip. You don’t have to worry that the razor will slip from your hands because the thumb notch and ridges on its ends prevent this. The product has a balanced weight, which makes it easy to control. As the most crucial part of the razor, the blade is made of stainless steel that doesn’t rust. On a side note, although the seller claims that the blade is sharp and shave ready, many customers state that it’s actually pretty dull even after you sharpen it. There are some men who find it to be sharp, so you can purchase this product for yourself and see if it’ll work for you. Featuring a sharp Japanese stainless steel blade that never gets rusty, Naked Armor Solomon gives you a pretty close and precise shave. When you decide to shave, make sure to first give the blade a quick strop at least one day before. You can do this with a leather strap that comes with it. Algum wood handle is very durable and it’s also accented with two-sided copper heads, so the razor is both sturdy and stylish. Inside the wooden box kit, there are also a convenient travel case, handmade natural soap, wood brush and sharpening wax. As you can tell, you get everything you need for a pleasant shaving experience in one place. It’s worthwhile mentioning that soap is made from coconut oil, butter and milk, so it’s completely natural and creates a perfect lather. Featuring an elegant wooden handle with comfortable grip and stainless steel blade, Topman Straight Razor is very easy to use. It has a classic vintage design, like the razors your father and grandfather used. The blade is of pretty good quality, so it doesn’t tarnish or rust. An interesting fact is that handle is made of scented rosewood and it’s seriously the pure wood. This is precisely the reason why the actual color may be slightly different than the one on the pictures. However, it’s very ergonomic, smooth and fits comfortably into the palm of your hand. You’ll be pleased to know that the blade is very sharp. Nevertheless, beginners might consider this as a problem because they can cut themselves easily. In the bottom line, this is pretty good razor at the very affordable price. Suitable for both rookies and professionals in wet shaving, Solomon Vintage Razor from Naked Armor has a professional grade, vintage style blade. It’s made of high-grade Japanese stainless steel that needs stroping before you use it for the first time. After that, it becomes much sharper and gives you a close shave. You can use it no matter if you’re right or left handed. The handle will feel great in your hand because it has the perfect balance and weight. While at it, the handle is made of a durable algum wood and accented with 115-grain copper heads to be practical, give you a good grip and look classy all at the same time. As a nice touch, there are also a travel case and nice sharpening wax included in the pack. If you’re not satisfied with the product for whatever reason, you don’t have to worry. This razor comes with a lifetime and money back guarantee, so you can try it out and decide whether it works for you or not. Meant mainly for more experienced straight razor users, Feather SS has exceptionally sharp stainless steel blades that cut hairs with surgical precision. With just one passing you get a close shave. If you want to get the best out of it and avoid getting cut, make sure to go slow and shave with the grain, then put a lather and shave against the grain. Always go slow, don’t press the blade too hard and focus on the angle and technique and everything should be fine. When the time comes, you can always replace the blade by just pinching the razor’s head, dropping out the used one and replacing it with a new blade. The great thing is that the handle is made of heat resistant silicone resin and has an excellent grip. That way you will have control over the shaving process the whole time. There isn’t a protective cover for the blade included, but if you need one, the manufacturer offers the option of buying it separately. 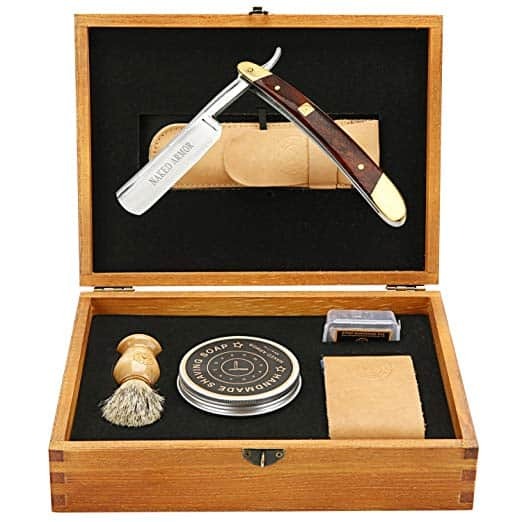 Coming in a decorative box made of real wood, A. P. Donovan Straight Razor has one of the finest Japenese steel blades. However, the blade doesn’t come shave ready and you’ll have to hone it before the use. To do this right, make sure to use the abrasive strop wax. The strop that comes with the product is rather small, so maybe you’ll want to use another one. During the shaving, you’ll have complete control over the process, providing that the razor is almost lightweight and the handle gives a good grip. Scratches on handle and blade are unabled thanks to the foam that’s inside and prevents this. 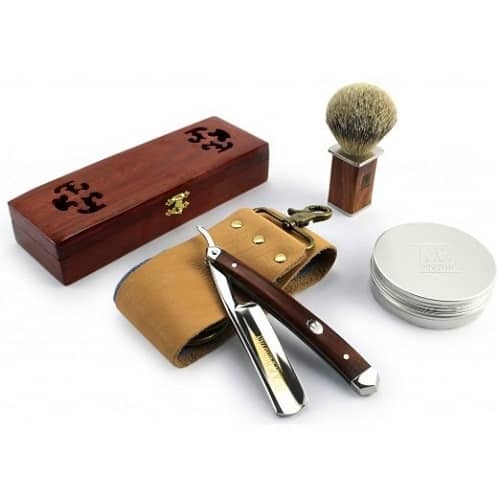 Although this shaving kit is pretty expensive, for the price you’ll get not only the razor, but also a sharpening wax and brush, and all that packed in a real wood box. Simple-to-open blade guard on Equinox Professional Razor allows you to safely and easily change the blades. Speaking of the blades, you get 100 of them gratis along with the razor. These are all single edge Derby blades, each individually wrapped. You can use one for two or three shaves, which means you get around 200 shaves at an affordable price. As the key thing in a razor, the blade on this product is made of a high-end Japanese stainless steel. On a side note, the blade tends to rust after you use it for some time. Designed to be ergonomic, this item will give you a close shave and provide just about right holding angle to avoid cuts and discomfort. It’s good to know that you should gently squeeze the protection cap before you close it. This way you’re securing that blades don’t fall out. Before you press your new straight razor to your face, it’s critical that you know how to use your new model. Shaving with a straight razor isn’t anything like using a safety or electric razor. It requires precision and experience. Unlike an electric shaver, you can’t just run a sharp blaze across your face leisurely. If you’re new to this, your first shave will be intimidating. But if you follow these steps, you’ll get the hang of it in no time. Here are the basic steps all straight razor users should follow for a close, refreshing shave. This is an additional preliminary step that will make your morning shave more enjoyable. Not only does the hot water clean your skin in preparation for shaving, but it also relaxes your body and gets you in the mood for a soothing experience. This step is easy to skip, and many men often overlook it, but your razor is a tool like any other that needs to be maintained and disinfected for the best use. The razor should be wiped down with a rag and cleaning solution to clear away bacteria. This not only treats your razor but also your skin. Beard shavers use a variety of lubricating creams and pre-shaving oils to prepare for a razor’s edge. These lubricating measures protect the skin against the blade and allow the razor to glide across the face smoothly. You might already be accustomed to shaving cream, but consider investing in a pre-shaving oil-based cream before applying your current cream brand. Pre-shaving oils are designed specifically for razor blade protection and decrease the likelihood of cuts. Not sure what the best oils are? Many high-quality products can be purchased through online retailers and at your local barbershop. It’s time to use your razor! To use it properly, grab both sides by its edges and pull it apart until it locks into an L shape. Be careful not to press your fingers against the blade. Once it’s in position, place your pointer and middle fingers on top of the shank (the metal finger placement area that has grip-protected scales), and your thumb should hold the razor in place under the shank. Lift the razor to the top of your face and work down, following the natural direction of your hair’s growth. Lightly push the skin apart to ensure the razor reaches the hair thoroughly. When you reach your nose and chin, lift up these areas to reach under. If it’s time to switch to your other side, continue to use your dominant hand for control. Don’t try to teach both hands to work the same way. Make sure you reach commonly forgotten areas like under the chin. Once your face is spotless, run hot water over your face and apply an alcohol-free aftershave. This is an important step towards moisturizing the skin and preparing it for the next shave. Just because you clean your razor before use doesn’t mean you don’t have to clean it afterward. Thoroughly run the razor under warm water and run it against a dry towel. These steps might seem straightforward, but once you press the razor to your face for the first time you’ll realize how powerful the tool is that you’re using. Learning how to shave is like learning how to ride a bike for men. You’ll need time to learn how to become an artful shaver, but it will come with practice. There are a plethora of handy videos that show shavers using their own razors. Turn to the Art of Shaving for additional tips and examples on how to use yours. So you’ve bought your first razor, started using it, and are getting better each morning with daily use. You’ll start to notice that your blade isn’t giving you the closest shave as it did when you first used it: how do you make it sharper? 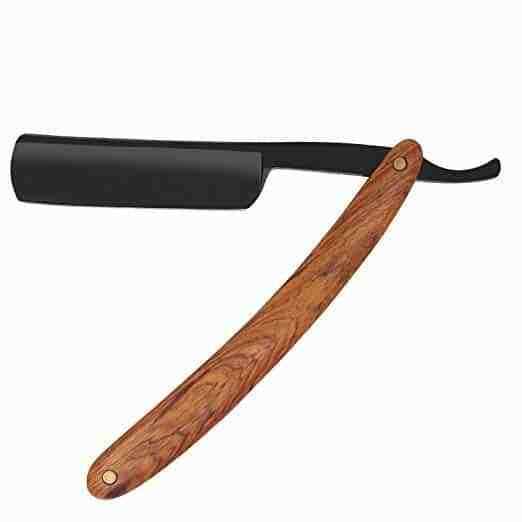 There are two methods that both works to sharpen a razor: using a leather strop and a whetstone. A strop is the most common method of sharpening a razor. Stropping polishes the edge of a blade and re-aligns it to its correct angle. Stropping should take place once a month. It’s very important that you learn how to strop carefully to avoid damaging your fingers, the strop, or razor. In order to slide your razor across the strop best, you’ll need to hang it on a secure hook that stands straight up. You’ll need to secure it past the L position so that it’s completely flat. If not, you run the risk of sliding it close to your fingers. Move the razor towards the back of the blade, never towards the cutting edge. Over time, this will destroy your strop. Common stropping mistake users make is moving the blade with too much force. This actually dulls the blade rather than sharpens it. Move the blade towards you from top to bottom gently. This will also make sure that you’re stropping the blade at the correct angle. If you lose control of your angle, you run the risk of destroying the blade’s qualities. Always remember that you’re simply polishing your blade. The goal is to simply keep it at its intended sharpness, and additional force will destroy the tools and hurt yourself. Never strop after shaving – this puts wear on the strop and can lessen its longevity. Always strop immediately before a shave to prepare the razor for optimal sharpness. Whetstone sharpening is less popular but just as effective. Its main benefit is that it’s a safer and easier way to sharpen. You also don’t have to sharpen as frequently as a strop. Whetstones only need to be used every 3-6 months. Like the strop, the whetstone needs to lay straight for safety and effectiveness. Laying it flat and running the razor directly over it will ensure that you’re using the correct angle. Lead the blade by its heel and not its edge. Using slow strokes protects the blade from being slide across the stone unsteadily. Be careful not to over-sharpen with too many strokes. It’s as simple as that. To see a great example and learn more tips, check out this tutorial. If you’re new to the straight razor world and are still deciding whether to invest in a new purchase, you might want to consider what it’s like to shave with other shaving options. Here is a complete comparison of what shaving is like with other devices compared to straight razors. A safety razor is a small device that you’ll find in most homes and is common among men and women. Safety razors can either be metal and intended for re-use or made with cheap plastic. The latter is not eco-friendly and more expensive because buyers will constantly have to buy new razor packs in bulk. Let’s not knock safety razors completely: the best safety razors are double-edged razors that provide a good quality shave, but their longevity is questionable. Even if a shaver purchases a metal one, the structure of the razor makes it difficult to clean and remove small stubborn hairs. Purchasing new blades is just as expensive as buying the plastic throw away ones. Straight razors in comparison are environmentally friendly because they are intended for as long of use as possible. They also provide the greatest flexibility and fluidity of movement and can be adjusted. They are very easy to clean and maintain. Never heard of a shavette? You’re not alone. It’s a relatively obscure product in the industry designed to help shavers transition from safety to straight. Shavettes are confusing because they look the same as straight razors. The only difference in structure is their size. Top rated shavettes are easier to handle because they are smaller. They are not manufactured with the same blade conditions as straight razors and provide a less close shave, but are perfect for beginners to test out before using straight razors. They don’t require honing, so no stropping or whetstones needed. Razor blades are easy to replace. However, someone wanting the closest shave possible shouldn’t get too comfortable with the shavette. Eventually, they’ll want to transition to the straight razor and find a model that suits them. Cartridge razors are easy to mistake for safety razors because they look identical. Safety razor vs cartridge razor explained: While safety razors have a protective safeguard above the razors to limit the blade’s movement against the skin, cartridge razors give a deeper shave with more pressure. The cartridge hinge allows the razor to trim hair easily with steady pressure from the shaver. 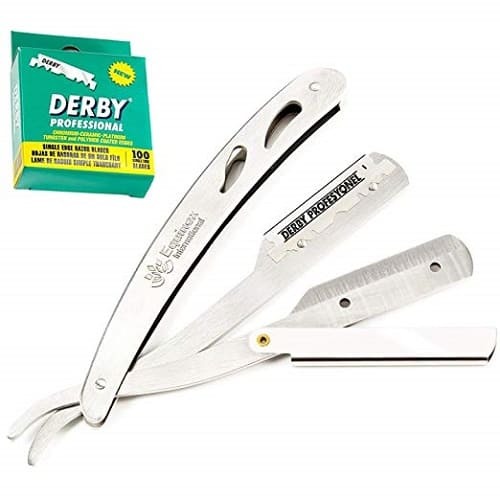 There are multiple blades close together within its structure, which prevents the razor from cleanly wiping out hairs on a face with one stroke. Often users will have to apply multiple strokes over their face to completely remove hairs. Straight razors give a closer shave than the cartridge with more fluidity of movement. Rather than having to go over an area multiple times, a straight razor removes hair smoothly on one go. Electric razors have become increasingly more popular throughout the last decade. Use is expected to only rise, and it’s easy to see why. People are sick of being nicked by their razors and don’t want to take the time to shave properly. Electric razors have become more efficient. They’re perfect for quick shaves or large scale shaves that don’t require precise trimming. The electric shaver is one of the best razors for shaving your head. Will developments in electric razor technology defeat the classic straight razor smoothness? Unlikely. The straight razor is the closest shave possible and is safe and protective if used correctly with experience. Those that don’t have time for the straight razor process will always prefer the electric razor to guarantee a cut-free skin during a rushed morning routine, but those that prefer craft and efficiency should never settle for electric. Getting the closest shave possible is not just about the right razor. There are other handy tools that completely enhance a shave. Some people are turned off by shaving cream if it’s too cold against their skin. It’s hard to believe at first that shaving cream warmers are a thing, but they’re ideal for anyone with sensitive skin. Even those that are used to a chilling shaving cream will enjoy the warm sensation of heated shaving cream. It really makes a difference in your morning shave. It will make the entire experience more relaxing. Don’t mistake these as exclusive products for babies. Shaving aprons come in handy if you’re already dressed and decide to touch upon a shave midday. Use a beard bib or apron to prevent staining your clothes with fractions of hairs from trimming. A barber shaping tool and a pair of small barber beard scissors come in handy for trimming. Barbers often carry a range of razor types to accommodate different shave types and facial hair. If you’re serious about your shave, consider stocking up on a few blade types: they’ll come in handy for all types of shaves. Head hair is commonly treated to maintain fullness. Why not give your beard the same care? Beard oil strengthens beard hair quality so you can grow your beard faster and grow a thicker beard as well. Have you always wanted a beard but never been able to achieve a full head of hair on your chin? The best beard oils can help. Straight razors make users feel like a professional stylist. So why not complete the picture with your own barber chair? To make your shave more comfortable, consider adding a durable barber chair to your bathroom to sit in for a more relaxing shave. Anyone with a beard knows they can get messy. Just like head hair, everyone can tell the difference between a well-groomed and dirty beard. 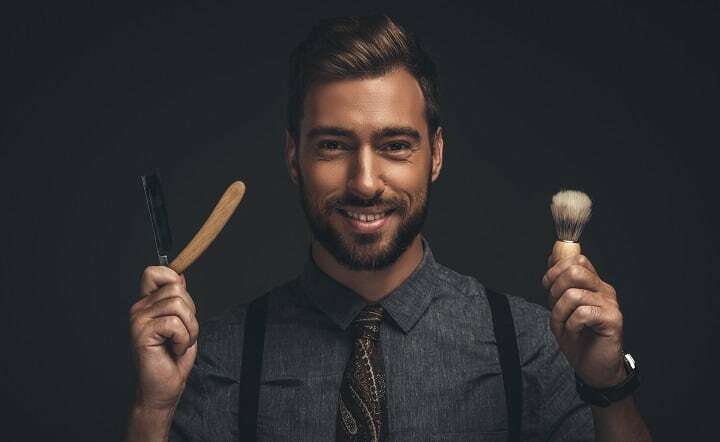 Ultimate beard grooming kits complete with the best beard comb can clean up your beard and add a shimmer of vitality and strength to your hair. What Razor is Best For You? A personal and stylish straight razor is perfect for anyone that has extra time in the morning to achieve the closest shave possible. Straight razors remind users to relax and make time to look their best in the morning. With the right tools and flow, a morning can be made better with the stroke of a straight razor. Finding the right razor for a beginner is complicated because of all the components that make each razor unique. However, this specificity makes it possible for anyone to find a razor suited for their experience level, hair and skin type. It’s perfectly normal and expected to feel uneasy about purchasing your first straight razor. It might take time, but when you find the right straight razor, you’ll never want to go back to how you shaved before. Photos from: nejron / depositphotos.com, homank76 / depositphotos.com, IgorVetushko / depositphotos.com, [email protected]/ / depositphotos.com, dero2084.gmail.com / depositphotos.com.